This love showed him the way of his future! For many years Spiros is involved to the greek dance media by his articles on dance magazines, radio and later some tv shows. The passion to create his own sound forced him to music production. In this way, he had the support of a main player like Marco Bailey is , and later became key member to MB group of labels. 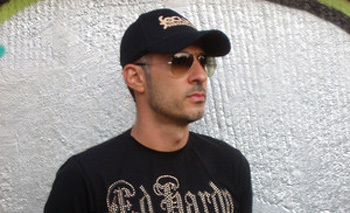 From 2002 untill today Spiro’s signs to some of the most respected techno labels like : Primate, Primevil, MB Elektronics, Patterns, Pornographic, Adult, to name a few and his tracks appears on the setlists of the biggest techno artists worldwide. This journey continues as Spiros launch “Omega Audio Recordings“ with his partner for many years Axel Karakasis. This label was one of the hottest techno labels worldwide featuring international artists and huge dj support! Besides that he was honoured to be nominated for 2 years in a row (2008 – 2009) as best techno dj in the annual SEEME festival awards! Next to his releases and dj gigs Spiros started a new label with a more personal sound that was always in his mind. The birth of his second imprint “Analog Mode“ records started on March 2008 and was heavily supported from techno frontline dj’s! As a result, nowadays his music & dj set’s rocks the dancefloors worldwide. After many years of hard work including 50 vinyl releases, gigs around the world, radio shows with dedication and focus on techno music, Spiros creates a new label that reflects his sound as it developed nowadays through the new modern influences of techno. It’s like, his personal touch to the sound that established him all these years, but this time he wants to take it one step further…so “Focus Records” is born and launched on February 2010! Always faithful and focused to the techno sound this artist keeps spreading his music all over the world and the same is expected for the future! !